Staton Flurry’s 4-year-old gelding Mr. Misunderstood remained perfect in four starts on the Churchill Downs turf course when he collared stablemate Big Changes inside the final furlong to score a half-length victory in Saturday’s 41st running of the $100,000 River City Handicap (Grade III) at Churchill Downs. Mr. Misunderstood, the 121-pound starting high weight in a field of five older horses, ran 1 1/8 miles over “yielding” turf in 1:55.94. Florent Geroux rode the winner for trainer Brad Cox, who notched the 999th win of his career. Breaking from the hedge, Mr. Misunderstood raced along the inside and tracked Big Changes, who dictated the pace through quarter-mile fractions of :25.88, :52.52 and 1:18.74. At the top of the lane, Geroux swung Mr. Misunderstood to the outside and surged past the leader in deep stretch to collect the eighth stakes win of his career. The victory was worth $62,000 and increased Mr. Misunderstood’s earnings to $772,354. He boasts an impressive record of 12-2-1 in 21 starts. After five stakes wins at age 3, including the Jefferson Cup and Commonwealth Turf (GIII) at Churchill Downs, this was Mr. Misunderstood’s third stakes win of his 4-year-old campaign. In June, he won Churchill Downs’ $200,000 Wise Dan (GII) and later prevailed at Ellis Park this summer in the $100,000 Kentucky Downs Preview Tourist Mile. Mr. Misunderstood returned mutuels of $3.40, $2.40 and $2.10 as the odds-on 3-5 betting favorite. Big Changes, ridden by Julien Leparoux at 119 pounds, returned $2.80 and $2.10. Another 4 ½ lengths back was third-place finisher Team Colors under Adam Beschizza and 118 pounds and paid $2.40 to show. The order of finish was completed by Sir Dudley Digges and Flatlined. Master Merion, Postulation and Oscar Nominated completed the order of finish. Mr. Misunderstood, a son of Archarcharch out of the Afternoon Deelites mare Jodys Deelite, was bred in Kentucky by Athens Woods. 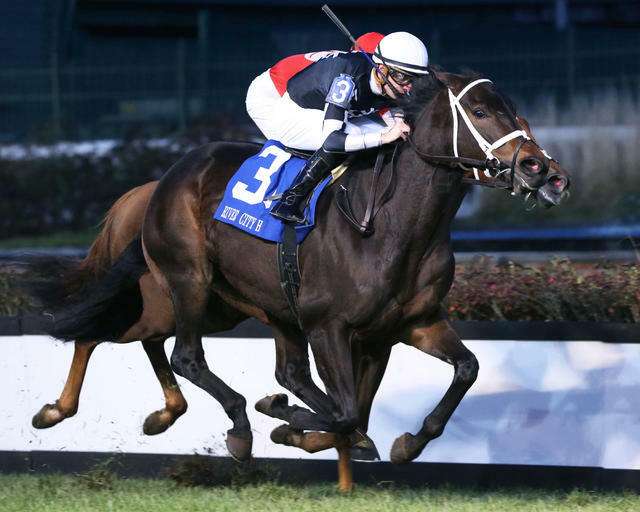 “(Mr. Misunderstood) will probably get a little bit of a break before we bring him back at Fair Grounds and if he keeps improving we’ll keep the Breeders’ Cup on our target for next year,” Cox said. Racing at Churchill Downs resumes Sunday with a 10-race card that begins at 1 p.m. (all times Eastern). There is a $173,820 carryover in Sunday’s 20-cent Single 6 Jackpot sequence, which will cover Races 5-10 starting at 3:03 p.m. Also, a $2,583 carryover awaits bettors in the finale’s $1 Super Hi-5 at 5:36 p.m.